We’d love your help. Let us know what’s wrong with this preview of Doctor Who by Nicholas Briggs. Sunlight 349 is one of countless Dalek Foundation worlds, planets created to house billions suffering from economic hardship. The Doctor arrives at Sunlight 349, suspicious of any world where the Daleks are apparently a force for good – and determined to find out the truth. The Doctor knows they have a far more sinister plan – but how can he convince those who have lived u Sunlight 349 is one of countless Dalek Foundation worlds, planets created to house billions suffering from economic hardship. The Doctor arrives at Sunlight 349, suspicious of any world where the Daleks are apparently a force for good – and determined to find out the truth. The Doctor knows they have a far more sinister plan – but how can he convince those who have lived under the benevolence of the Daleks for a generation? is Clara in this story line? Beth No. It's just the 11th Doctor. This is a book my child had been insisting I read as the major antagonists were the Daleks! I found the story to be fast-paced, and a little tense as we find out about a number of planets, managed by the Daleks, in a region of space where Daleks are seen as benign and caring by a large number of humans settled on these worlds. Nicholas Briggs captures Doctor #11's (or #12's if you include the War Doctor in your count) twitchy energy well. He even has the Doctor acknowledge to himself, at least a This is a book my child had been insisting I read as the major antagonists were the Daleks! I found the story to be fast-paced, and a little tense as we find out about a number of planets, managed by the Daleks, in a region of space where Daleks are seen as benign and caring by a large number of humans settled on these worlds. Jedenáctka se tu vážně chovala jako Jedenáctka... a já Dáleky miluju. Takže není co řešit. Úplně si umím představit tenhle příběh zfilmovaný. Umím. Trochu mi to místy sice připomínalo Pandoricu, ale koho to zajímá. Prostě EXTERMINATE! When I saw that the author's name on the cover, I was intrigued. Nick Briggs is known better as the voice of the Daleks and the Cybermen, or as half of the men behind the Big Finish audio releases of Doctor Who. I was pleasantly surprised to find this story superbly crafted. It had numerous twists that I didn't see coming, and kept me interested from beginning to end. My only quibble with the entire book is that the epic ending was a little too far-fetched, even for the Doctor Who universe, otherw When I saw that the author's name on the cover, I was intrigued. Nick Briggs is known better as the voice of the Daleks and the Cybermen, or as half of the men behind the Big Finish audio releases of Doctor Who. My only quibble with the entire book is that the epic ending was a little too far-fetched, even for the Doctor Who universe, otherwise I'd have given this full-marks. An interesting take on Dalek supremacy, with some genuine edge-of-seat moments, although the presence of three children in the Doctor's care does veer towards the cutesy in places. Interestingly, Briggs' Doctor is an excellent prediction of the toned down Matt Smith we are seeing in series 7.2 - as compared to the manic irritant of his earlier series. The Dalek time controller is trying to manipulate the Doctor, so that he helps find a super weapon. This is an interesting story technique, it jumps about a bit but does work. The idea of Daleks being good has been done before, but this time has a different spin. A good read. Sunlight 349 is only one of at least 400 worlds, created to house billions of people. Worlds created by the Daleks. The Doctor arrives on Sunlight 349, suspicious of these planets and above all suspicious of the Daleks. Since when are the Daleks ‘nice’? What he finds out is that the Daleks have a plan. A plan that might not be so nice after all. Together with a journalist and three orphaned children, the Doctor tries to find out the Daleks’ Read this review, and many more on my blog October Tune! Sunlight 349 is only one of at least 400 worlds, created to house billions of people. Worlds created by the Daleks. The Doctor arrives on Sunlight 349, suspicious of these planets and above all suspicious of the Daleks. Since when are the Daleks ‘nice’? What he finds out is that the Daleks have a plan. A plan that might not be so nice after all. Together with a journalist and three orphaned children, the Doctor tries to find out the Daleks’ plan. But not without the usual trouble. So a Dalek book written by Mr. Dalek himself, Nicholas Briggs. When I saw this book I got very excited because I am a huge fan of the Daleks (though I actually also hate them with a burning passion). So I took it with me and started it as soon as I could. I was intrigued by the whole ‘The Daleks are nice’ storyline. I’d read about it before in the Ripple Effect, a short story featuring the Seventh Doctor and Ace, and though that wasn’t really one of my favourite stories after all, I did like the nice Daleks. Of course, like in TRE, the Doctor tries to show everyone (who believes in the nice Dalek story) how horrible and hostile the Daleks really are. But that’s not made easy, because these Daleks are very good actors. After a while, it really made me think ‘are these Daleks really nice after all?’. In this book, the Doctor is companionless. I figured this probably happened after The Angels Take Manhattan and before The Snowmen (or quite possibly after this?). But, he isn’t really companionless after all. In fact, in this story he has four companions. Three little ones, called Sabel, Jesibeth and Ollus; and a journalist called Lillian Belle. I really loved the kids, they were talented and smart like their parents, and even though the oldest was only twelve (the youngest being five) they helped the Doctor as much as they could, they even helped him save the worlds at the end of the story. Though sometimes I was a bit confused (which I will talk about in the ‘what I didn’t like’ section), I found it a very easy and thrilling book to read. The writing was simple but very intriguing and at some points I just couldn’t stop myself from reading til the end of the chapter! I have to admit, I found it a bit predictable. Of course, I knew right away that the Daleks weren’t nice after all, that there was something going on with those Sunlight planets. Then, there was a part with the Cradle of the Gods (you’ll find out what it is when you read the book), and something happened there that I had predicted long before it actually happened. Then there was the ‘resistance’, I told myself that what/who they were before it was announced in the story. It was also quite confusing at some points. In the beginning, there were some tiny chapters, one from the point of view of a little girl, which made me question a lot; who was the little girl, what happened to her, why was she where she was? In the end, these questions were answered, but I kind of found that small chapter unnecessary. Near the end of the story, during the whole ‘is the world going to end or is the Doctor going to save everyone (of course, it’s always the latter)’, there was quite some confusion. I had to reread the whole part twice before I finally understood what happened. Pretty much as it says on the 2-star rating packet, I thought this book was okay. The writing style was very simple, but I understand that's because it has a wide readership range (in fact, my 8-year old is halfway through it and says it's "good"). The Doctor, having received a mysterious message, goes to the source of a distress call and finds three children on a ship. They've had some Dalek-related dramas (view spoiler)[ resulting in their parents committing suicide (hide spoiler)] , and the D Pretty much as it says on the 2-star rating packet, I thought this book was okay. The writing style was very simple, but I understand that's because it has a wide readership range (in fact, my 8-year old is halfway through it and says it's "good"). The Doctor, having received a mysterious message, goes to the source of a distress call and finds three children on a ship. They've had some Dalek-related dramas (view spoiler)[ resulting in their parents committing suicide (hide spoiler)] , and the Doctor manages to get them back to the planet they originally came from. This was an excellent start and very promising. But from there they just sort of meander across a range of planets, and things happen around them that they react to, but sometimes they don't even really bother doing that - (view spoiler)[ like when one of the sisters is kidnapped by the Daleks and the Doctor is all like *shrug* oh well, can't save 'em all (hide spoiler)] , which felt SUPER out of character, especially for the Matt Smith incarnation. The best parts where the dystopian bureaucracy bits - the courts, the custody discussions - but nothing too much came of it all in the end. Nicholas Brigg's first book 'The Dalek Generation' is a intelligent read that nicely slots into 'The Snowmen'. The idea of the Daleks being seen as a force of good is a interesting one that makes way for some great ideas. One of these being how it's illegal on these sunlight worlds to show hatred towards the Daleks. The book also plays with the limitations for the Daleks of being nice pretty well too, detailing their inability to exterminate anyone in public and using logic instead, such as the Nicholas Brigg's first book 'The Dalek Generation' is a intelligent read that nicely slots into 'The Snowmen'. The idea of the Daleks being seen as a force of good is a interesting one that makes way for some great ideas. One of these being how it's illegal on these sunlight worlds to show hatred towards the Daleks. The book also plays with the limitations for the Daleks of being nice pretty well too, detailing their inability to exterminate anyone in public and using logic instead, such as the scene where the Daleks shoot three men and a woman underground, then later bring them out seemingly alive to humiliate the Doctor in front of a audience of shoppers. The Doctor's companions in the book are three kids called Ollus, Sabel and Jennibeth. This is one aspect of the book that works incredibly well. All three kids come across as very likeable characters and you really find yourself caring for them during your time reading the book. I particularly liked how you got to see them progress from children to elderly people. The ending is a well-suited one for these characters and neatly ties the book together. As for the Doctor, I've seen some people say he's badly written but I disagree completely. The Doctor is fantastically written and is exactly how you'd imagine he'd react to the situation. His attitude towards the kids is a lot like how this Doctor talks to children in the show. This is the first Doctor Who novel that I've listened to (through Audible), rather than having read it myself, and as of the day of this review (6th May 2013), Nicholas Briggs' story is far superior to any of the current onscreen season's offerings (so far...), and in my mind would make an absolutely fantastic 2 part story. The plot, on the whole, feels like a classic series Doctor Who Dalek story, peppered nicely with the racy pace, and emotional depth (yes, I even shed a tear...) of the curren This is the first Doctor Who novel that I've listened to (through Audible), rather than having read it myself, and as of the day of this review (6th May 2013), Nicholas Briggs' story is far superior to any of the current onscreen season's offerings (so far...), and in my mind would make an absolutely fantastic 2 part story. The plot, on the whole, feels like a classic series Doctor Who Dalek story, peppered nicely with the racy pace, and emotional depth (yes, I even shed a tear...) of the current generation of Doctor Who, it's twists and turns leaving you guessing to the end - FANTASTIC! Nicholas Briggs narrates his story superbly, relaying a real sense of depth to the main players (this can especially be said of his narrated portrayal of the Doctor himself), and as you would expect his Daleks (via his voice box) sound as effectively menacing as his Daleks do in the current TV show. I personally liked the use of the minimal ambient music that is played occasionally, and felt it was an effective tool to highlight the contrasting atmospheres presented throughout the story without distracting you from Briggs' heart felt narration. This is just... bad. I don't even know where to begin with this mess of a novel. Firstly, the Doctor's dialogue is extremely hard to read in Matt Smiths voice and tone. It's really as if it was written by someone who had never actually watched an Eleventh Doctor episode. The things he would say and characterisation was all completely wrong. Secondly, the whole book involves The Doctor babysitting children the entire time and honestly, it's just cringe-worthy and the children are written as if the This is just... bad. I don't even know where to begin with this mess of a novel. Secondly, the whole book involves The Doctor babysitting children the entire time and honestly, it's just cringe-worthy and the children are written as if the author has never actually spoken or been one himself. Thirdly, The Daleks are just weak as anything in this book. Their plan is about as ridiculous as anything we've ever seen in Doctor Who and really in the end this book is just one of those times the author is trying so hard to come across as clever, but falls flat on it's face. Briggs has a good handle on describing the 11th Doctor in prose. That was a strong point. The weak point was the Daleks' villainous plot, which was a bit vague and finger-waggling-hand-wavy. Fun and quick to pass the time as long as you don't analyze it too much. I really, really wanted to like this book, however I found it to be.....off. I can't exactly put my finger on it, but it barely felt like DW to me. For almost as long as Doctor Who has been on television screens, his adventures in space and time have seen him facing, time and again, his enemies from Skaro: the Daleks. Yet the Daleks have rarely featured in the Doctor’s paperbound adventures, appearing in a mere three novels outside of the Target novelizations of their appearance in the old series (and even then, two of the TV stories were never novelized). 2013 though has seen a new addition to those adventures with The Dalek Generation, an For almost as long as Doctor Who has been on television screens, his adventures in space and time have seen him facing, time and again, his enemies from Skaro: the Daleks. Yet the Daleks have rarely featured in the Doctor’s paperbound adventures, appearing in a mere three novels outside of the Target novelizations of their appearance in the old series (and even then, two of the TV stories were never novelized). 2013 though has seen a new addition to those adventures with The Dalek Generation, an eleventh Doctor written by none other than Nicholas Briggs, the man behind the Dalek voices heard in the new series. How does his tale stand up then? For those who might be in the dark as to who Briggs is, he is far more than just the voice of the Daleks on TV. Through his work on the Doctor Who audio adventures produced by Big Finish Productions, Briggs is also a writer, producer and director with many Who stories under his belt as well as voicing the Daleks, Cybermen, Ice Warriors and other aliens both for Big Finish and on TV. So this isn’t the case of an actor being turned lose to write a tie-in novel simply because he’s an actor on the series. He’s a writer in his own right. Briggs obviously knows his Daleks well and he puts them to effective use. Fans are used to seeing the Daleks as an invading and destructive force, exterminating all those who stand in their path. But what happens when the Doctor lands on a world where the Daleks aren’t a force of evil, but instead quite the reverse? It’s a premise that has been touched upon only a handful of times by the series (notably in the lost second Doctor story Power Of The Daleks as well as the recent new series episode Victory Of The Daleks) and Briggs puts it to fine use here as the Doctor finds himself on one of the 400 Sunlight Worlds, set up by The Dalek Foundation, and trying to convince people of their being evil. Briggs also brings some new elements for the Daleks, including a Dalek type originally introduced for the Big Finish audios that becomes pivotal to the plot here. The novel then features both classic Who monsters and a classic Who premise put to excellent use. The Dalek Generation also captures a lot of the feel of the new series as well. Briggs’ plot has a “wibbly wobbly, timey wimey” element to it that becomes more and more apparent as the novel heads towards the end. The novel features the Doctor traveling on his own (judging from both the cover art and his attitude at various moments, it would appear to be set in the gap between the recent episode The Angels Take Manhattan and The Snowmen) and Briggs does an effective job of capturing the various, often contradictory, character traits of this Doctor. The book features a group of children effectively becoming the Doctor’s temporary companions, something else that we’ve seen in the eleventh Doctor’s TV stories as well as his excellent rapport with them, with some of the books best moments being the scenes the Doctor has with them. That it captures the feel of the show has a downside though. The novel has one very sizeable flaw, one that it shares with some recent episodes of the new series: it’s rushed. Briggs pacing keeps it moving and it is certainly never dull. The problem is that the reader rarely gets a grasp on where they are and what’s going on. The Sunlight Worlds, the Cradle Of The Gods and indeed the Daleks plan are all highly intriguing concepts but are never fleshed out. For that matter, neither are most of the characters for that matter with the exceptions of the Doctor and the children, many seem like caricatures rather than fleshed out. The result is the Daleks plan ends up feeling more abstract that concrete. The ending itself is very rushed and feels oddly derivative of some of the episode endings that we’ve seen recently and as a result feels quite hollow. The book might well capture the spirit of the new series a bit too well then. In full disclosure I won three Doctor Who books in a giveaway on Facebook. I initially thought the Doctor’s personality was really off. He lacks energy and excitement; he is also lot less caring. While it seems likely this is set during one of his darker periods, prior to the TV episode "the Snowmen" before his revelation abut Clara and at a time when he had decided to do no more meddling. While his personality may be correct for the period it is really trying to see him like this for the entire In full disclosure I won three Doctor Who books in a giveaway on Facebook. I initially thought the Doctor’s personality was really off. He lacks energy and excitement; he is also lot less caring. While it seems likely this is set during one of his darker periods, prior to the TV episode "the Snowmen" before his revelation abut Clara and at a time when he had decided to do no more meddling. While his personality may be correct for the period it is really trying to see him like this for the entire book, and it just doesn’t seem right. There are also things that don’t seem right even for a dark period, he is mean to the children, even at his unhappiest of times the Doctor always seems to help and care for children. He is also doesn’t have any of the ‘alien’ feel about him, apart from a couple of times that he mentions he is not human, a reader really couldn’t tell that there was something ‘different’ about him. He is also very passive and pretty much useless, it is left to the other characters to solve the problems. While again the Doctor is in one of his darker periods, it just isn’t enjoyable to see him like this. There were also a couple of specific things he did that really weren’t right for him. First he causes a train to crash, then later puts himself of television and broadcasts himself over the world. The Doctor even as the best of times hides away from the public and putting his image out like this seemed really wrong. I did enjoy the idea of the Dalek’s pretending to help humans, something that’s only been done a couple of times before. The pacing was slow and the story really dragged. There were times when things took too long to resolve or repeated too much. I did enjoy the ending and it did do something to save the book. Overall this was on okay book, the Doctor is in one of his darker periods and his personality may be right for this timeframe, it isn’t enjoyable to see him like this, especially as it lasts for the entire book and he doesn’t turn around near the end as he normally does during his dark periods on a TV show. The slow pacing reflected the Doctors lathergic attitude and made the story less enjoyable. 'The Dalek Generation' was quite a disappointing book. After reading the blurb I really wanted to read it and the first few chapters were brilliant. They were really well written, and intrigued me into the plot of the story. After that I really expected a lot from this book. I expected it would be the best book in the 'Doctor Who New Series Adventures'. I was wrong. The Doctor was not the Doctor. He wasn't the one from the TV show, or so I felt. The Doctor is clumsy, yes but he doesn't cause train crashes. Also some of his dialogue was too dark. This is meant to be set somewhere in between 'The Snowmen' and 'The Bells of Saint John'. It wasn't the same man that we saw after he realized that Clara is still alive. Moving on, the Doctor used the sonic screwdriver too much. This book made it seem like the Sonic Screwdriver was capable of pretty much everything - and what is wasn't capable of doing, a toy spaceship could. One of the worse things about this book was the huge flaw in the plot. This is set after 'Asylum of the Daleks' and in the end of 'Asylum of the Daleks' Oswin removes all information on the Doctor from the Dalek Pathweb - where all the Dalek's store information, this meant all of the Daleks forgot the Doctor. So, why - in this book - do the Daleks know who the Doctor is? This bugged me all through the rest of the book after I realized it about 10% in. This is the second book in the Doctor Who series that i have read, the first being touched by an angel. I enjoyed the first, but this one seemed anticlimactic. It builds tension from the beginning and seems to lose its way about 3/4ths of the way through. Caution Spoilers Ahead. (view spoiler)[ During the book this brain reading game show is mentioned multiple times. Leading me to believe that the doctor would have highjacked that show and shown the images in his memory of all the wrong the Dalek This is the second book in the Doctor Who series that i have read, the first being touched by an angel. I enjoyed the first, but this one seemed anticlimactic. It builds tension from the beginning and seems to lose its way about 3/4ths of the way through. Caution Spoilers Ahead. This caught my attention because of the author. I mean how can a Doctor Who book written by Nicholas Briggs fail?! The book started off well with some fun action and an interesting plot that kept me guessing. However, the middle lulled and, frankly, I got bored. I set it aside for a while and read some other books that seemed much more interesting to me at the time. But I decided to come back to this before I lost all of my memories of what had happened in the first half. I was happily surprised This caught my attention because of the author. I mean how can a Doctor Who book written by Nicholas Briggs fail?! The book started off well with some fun action and an interesting plot that kept me guessing. However, the middle lulled and, frankly, I got bored. I set it aside for a while and read some other books that seemed much more interesting to me at the time. But I decided to come back to this before I lost all of my memories of what had happened in the first half. I was happily surprised to find that the end picked up again and kept my attention. The ending had a twist that I did not see coming and I ended up being pretty pleased with it. There were some characters introduced who were ultimately pointless I thought. The woman who gets the introduction all to herself is not seen again for the majority of the book and when she does show up again it is for a very short time and she does not do much. The writing style seemed a bit rough which is understandable as this his first novel attempt. Hopefully he will be able to clean up his style and produce some great books in the future! 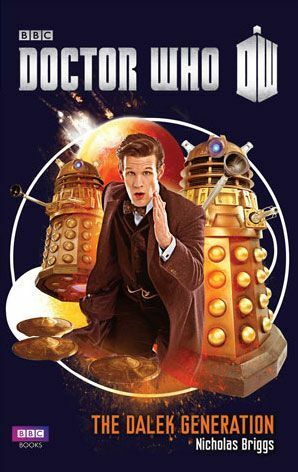 This book is based on the television series and has Matt Smith's Doctor as the main character. He has no companion along for the ride. In this one, the Daleks have rescued humans and created a living society for them to dwell. The Doctor knows there must be more to it than meets the eye. I enjoyed the premise of this story. I liked the idea of one person knowing the truth while the rest of society respects and reveres these false saviors. How do you get people to realize the truth? The execution This book is based on the television series and has Matt Smith's Doctor as the main character. He has no companion along for the ride. In this one, the Daleks have rescued humans and created a living society for them to dwell. The Doctor knows there must be more to it than meets the eye. I enjoyed the premise of this story. I liked the idea of one person knowing the truth while the rest of society respects and reveres these false saviors. How do you get people to realize the truth? The execution of the story wasn't the best though. For most of the story the Doctor had three young children for companions. I didn't have a problem with them and they were there to show the Doctor as a caring being. I believe too much of the book was spent on this aspect and not enough with the Doctor and the Daleks. As for the characters, nothing really stood out. The portrayal of the eleventh Doctor and the Daleks were fine. This was so good! And the ending completely surprised me. It's a fun book but bit confusion. I enjoy reading it, and sometime made me nervous. In the end, everyone have a goog ending, Doctor still aonle which make me sad. This was actually a pretty good 11th Doctor adventure until the very end, which was too deus ex machina even by Doctor Who's very liberal standards. Still a fun tale, well narrated by the author. This Doctor Who book had a slow start to it. But the story did pick up and was an enjoyable Doctor Who story. Nicholas Briggs is a British actor and writer, predominantly associated with the BBC science fiction television series Doctor Who and its various spin-offs. Some of Briggs' earliest Doctor Who-related work was as host of The Myth Makers, a series of made-for-video documentaries produced in the 1980s and 1990s by Reeltime Pictures in which Briggs interviews many of the actors and writers involved i Nicholas Briggs is a British actor and writer, predominantly associated with the BBC science fiction television series Doctor Who and its various spin-offs. Some of Briggs' earliest Doctor Who-related work was as host of The Myth Makers, a series of made-for-video documentaries produced in the 1980s and 1990s by Reeltime Pictures in which Briggs interviews many of the actors and writers involved in the series. When Reeltime expanded into producing original dramas, Briggs wrote some stories and acted in others, beginning with War Time, the first unofficial Doctor Who spin-off, and Myth Runner, a parody of Blade Runner showcasing bloopers from the Myth Makers series built around a loose storyline featuring Briggs as a down on his luck private detective in the near future. He wrote and appeared in several made-for-video dramas by BBV, including the third of the Stranger stories, In Memory Alone opposite former Doctor Who stars Colin Baker and Nicola Bryant. He also wrote and appeared in a non-Stranger BBV production called The Airzone Solution (1993) and directed a documentary film, Stranger than Fiction (1994). Briggs has directed many of the Big Finish Productions audio plays, and has provided Dalek, Cybermen, and other alien voices in several of those as well. He has also written and directed the Dalek Empire and Cyberman audio plays for Big Finish. In 2006, Briggs took over from Gary Russell as executive producer of the Big Finish Doctor Who audio range. Briggs co-wrote a Doctor Who book called The Dalek Survival Guide.